Spring’s early arrival creates more mismatches in ecosystems. Across the West, spring has come early this year — by as much as three weeks in some places. But what does that mean, exactly? From an astronomical perspective, the first day of spring is the spring equinox, the day when the sun passes directly above the equator, occurring around March 21 each year. From a biological perspective, spring arrives when plants and animals respond to an accumulation of seasonal signals, such as growing warmth or longer days. Plants bud, birds fly north and insects emerge from tree holes and leaf litter. This seasonal timing of plant and animal life stages is called phenology. 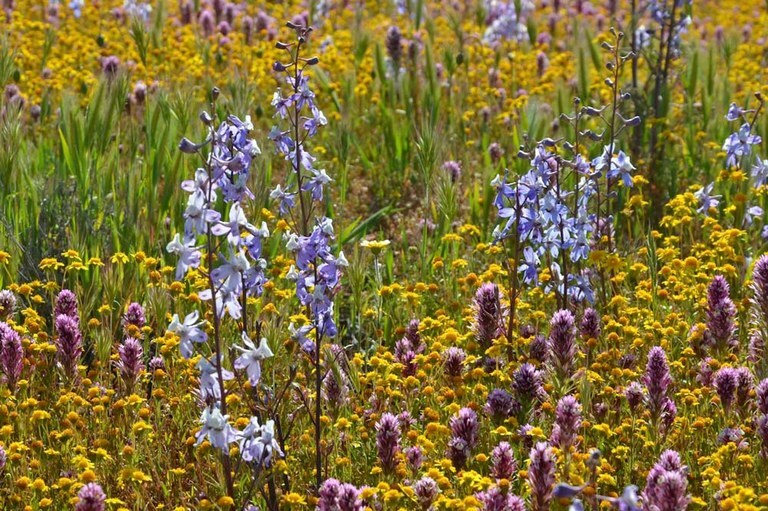 This spring, wildflowers filled California's Carrizo Plain National Monument, a grassland in the Central Valley. For many plants, warming days are one of the main signals that it’s time to wake up from their winter slumber. As climate change has caused the West to warm earlier in the year, “biological” spring has shifted, too. In many parts of the West, it has crept early across the landscape. The USA-National Phenology Network (USA-NPN) studies just how much the start of spring is changing using extended spring index models, computer simulations based on a historic data set of lilac and honeysuckle phenology begun in the 1950s. The models also help scientists predict future spring arrivals. 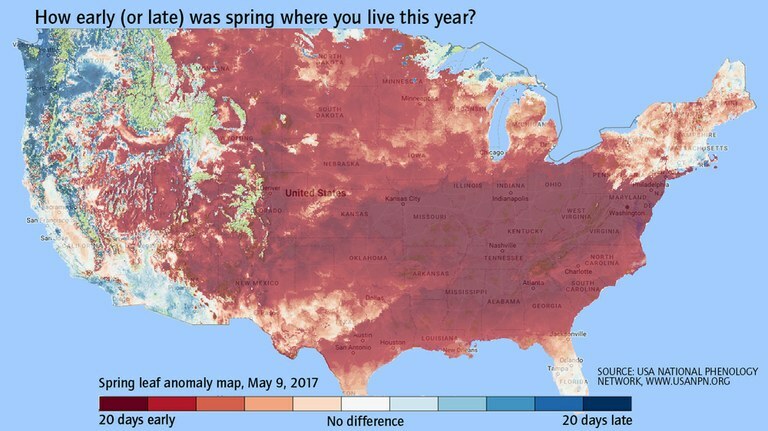 Scientists update spring index maps each day on the USA-NPN website, as well as spring leaf anomaly maps, which compare the current year’s spring to 30-year averages. As the May 9, 2017 spring leaf anomaly map shows, in most of the West spring has come 12 to 20 days early this year, relative to the long-term average. The exceptions are high-elevation Western mountains (in green on the map), where spring is expected to arrive on time, and the Pacific Northwest and parts of the Pacific coast (in blue), where gusts of cold Arctic air have delayed spring. For example, the 2014 National Climate Assessment notes that some migratory birds now arrive at their breeding grounds after food is most abundant. That’s because temperatures at their wintering grounds, which tell the birds it’s time to head north, are changing more slowly than at spring breeding grounds, which signal to their food plants that it’s time to start making nectar and fruit. On the mammalian side, the earlier spring in Alaska means that caribou have a harder time finding good forage while they breed. For humans, phenological mismatches can affect harvests by changing when crop pollinators arrive, how dense herbivorous insects are on crops, or even when animals that eat crop pests appear. And allergy sufferers, take note: Ragweed has begun producing pollen later into the fall, thanks to a lengthening growing season. All of these mismatches embody an idea that ecologists call asynchrony. Ecological systems exist because many different species have evolved to follow the same seasonal schedule, behaving in synchrony, relying on one another for the resources they need. Now, with climate change, some of those systems are unraveling — and this spring’s early arrival is a sign of more asynchrony to come. Note: This article has been updated to clarify the history of USA-NPN. Maya L. Kapoor is an associate editor with High Country News.